TORONTO, ON – Muddy York Brewing has announced details of the latest in a quick succession of seasonal releases for late summer and early fall. We are just bursting at the seams with hoppy goodness here at Muddy York HQ and quite frankly we are running out of room in our hop freezer. Necessity is the mother of invention, so a brand new intensely hopped beer was created! This is a big one at 7% and 70 IBUs. Magnum, Topaz and Equinox give this beer substantial hop flavour with notes of tropical fruit. 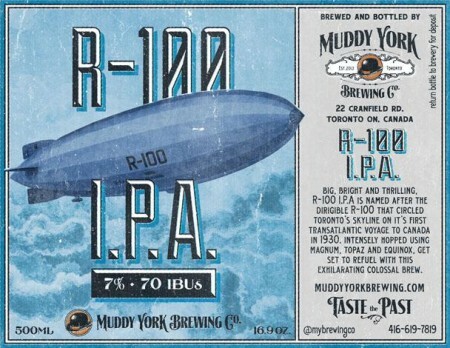 R-100 IPA is available now in bottles at the Muddy York retail store.